Looking back, I think it was the "gift basket" sign that turned me off on Melrose's Fancifull. After all, I had driven past the place hundreds of times over the past 10 years, and had never once had the urge to pull over. 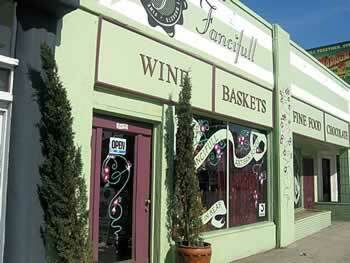 "That's why I hate calling us a basket store," said Terry August, as she showed me around the 21-year-old gourmet shop located between Larchmont Blvd. and Gower St. she owns with husband Wally. The Augusts are counting on a recent spruce-up of the 3,600-square-foot storefront-including a new paint job that touts "Wine, Baskets, Fine Food and Chocolates"-to clear up any misconceptions. "People come in and go `oh my goodness' when they see what we actually have in here," said Terry. Indeed, I was like a kid in a candy store on my maiden visit to Fancifull. The store is stocked full of really good stuff. In addition to beautiful and creative artisan baskets, the store features a wide array of gift items including candles, bath products, teapots, photo frames, baby items and books. "I just really want people to get excited when they get one of our baskets," said Terry. "That's why we have both high end stuff, and junk food." In addition to variety, the Irving Blvd. residents strive to fill their store with items in a range of prices. "When we started this business, I said I wanted to be able to offer customers something really nice, whether they planned to spend $10 or a thousand," said Terry. They succeeded with gift items, and with gourmet foods, as well, offering chocolates-in individual bars to huge, gift-sized boxes-to crackers, olives, nuts, tapenades and the world's best chocolate chip cookies that, according to the Augusts, "are impossible to keep on the shelf." Then there's the wine. "We sample hundreds of wines every year. We often travel to far away places to meet a great winemaker and see his vineyards firsthand," said Wally. Same goes for cheeses. "We love to eat," said the Augusts, who visit farms and creameries to find the best and freshest cheeses to stock their cooler. "It's the slow food thing. the dedication to food and the best ingredients that we are passionate about," said Wally. The couple said they discovered early on that customers want convenience. Which is why they also offer fresh flower arrangements. "Many of our corporate clients will have us put together a basket for the men and a floral arrangement for the women," said Terry. Or, people can just walk in and we'll put something beautiful together for them, she added. "Now, if we only had a green grocer," Terry says wistfully. "We've been thinking about having a farmer, or someone from the Larchmont Farmer's market come in and have a space here." The Augusts, parents of two grown children, admit they'd contemplated moving their business. "We went back and forth, and finally just said, `we have a great space here and we're staying'," said Terry. "And we really love belonging to the community." With that commitment comes a goal to get people into the store. 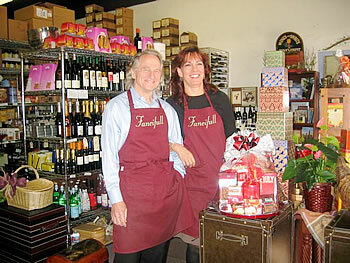 The Augusts host tasting events every month or so, featuring items from Fancifull's shelves including wine, cheese, sausage and chocolates. "Check out our website for dates," said Terry. "They're basically just free parties, and a way to welcome people to our store."